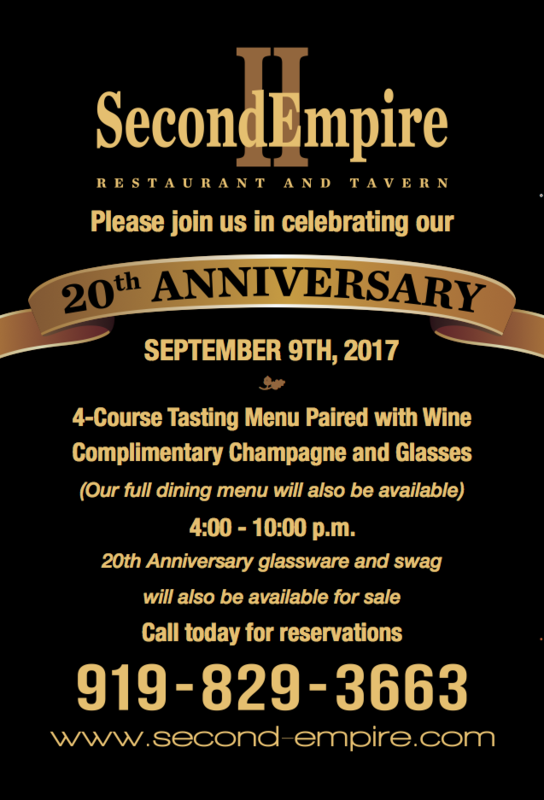 Please join us in celebrating our 20th Anniversary on September 9th, 2017. 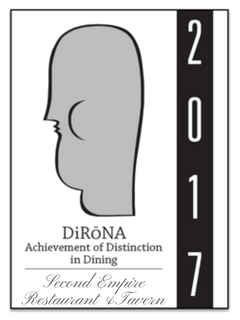 Now approaching our 20th year of operation, Second Empire Restaurant and Tavern is proud to be the recipient of the AAA Four Diamond Award since 2004 (and Raleigh’s only recipient), the recipient of the DiRoNA (Distinguished Restaurants of North America) Award since 2005 and the recipient of the Wine Spectator Award of Excellence since 1999. Second Empire is the Ultimate Dining Experience in an Elegant yet Relaxed Atmosphere! Located downtown Raleigh in the elegantly restored Dodd-Hinsdale House (circa 1879), Second Empire combines history, atmosphere, and gourmet cuisine for an unforgettable dining experience. We suggest beginning your evening with a cocktail or glass of wine in our rocking chairs on the front porch. You will then be seated in one of our main dining rooms. Formal, yet maintaining a relaxed ambience, Second Empire features wide, arched passages, fireplaces, 14 foot ceilings and an abundance of windows. Each dining room comfortably seats up to 50 people. If you are looking for a more informal setting, you may ask to be seated in our Tavern where you will be able to select from either the main dining room menu or our Tavern menu. The Tavern is surrounded by exposed brick walls for a cozy dining experience. The Tavern Bar is the perfect setting to meet friends for drinks after work. Be sure to sample the latest beers on tap or have the bartender fix you the best martini to ever pass your lips! Second Empire is the perfect setting for an elegant wedding ceremony, in or outdoors, reception, rehearsal dinner and bridal luncheons. We can assist a bride with her photography, flowers, entertainment as well as the food and service to make her day as seamless as possible. For corporate gatherings and other special group occasions, Second Empire provides four private dining rooms: The Pine Room, The Raleigh Room, The Capitol Room and The Atrium. Located upstairs on the main dining floor, The Pine Room can seat up to 50 people. It features walls paneled with North Carolina pine and French doors that open out onto the back porch. The Raleigh Room and the Capitol Room are located downstairs on the Tavern level and feature exposed brick walls and arched brick doorways. Seating in either of these rooms can be set up as one large square table, two long tables or 2, 4 or 6 top arrangements. The Raleigh Room can seat up to 30 people and The Capitol Room, which also features a lighted carved glass art piece of the State Capitol, can seat up to 20 people. The Atrium can seat up to 55 people. Audio-Visual and hard-wired internet access are available in all four rooms. Open Table Diner’s Choice for one of the Most Romantic Restaurants in America! Second Empire Restaurant & Tavern is listed as one of Top 100 Most Romantic Restaurants in America, only 7 of the 100 restaurants listed are from North Carolina! Top 100 Most Romantic Restaurants in America according to OpenTable diners. The complete list may also be viewed at http://www.opentable.com/m/most-romantic-restaurants-in-america/. OpenTable Diner’s Choice List: Best Service! Based on reviews collected from OpenTable diners between February 1, 2012 and January 31, 2013, the 100 award-winning restaurants received the highest scores. The list of winners is derived from more than5 million reviews submitted by OpenTable diners for more than 15,000 restaurants in all 50 states and the District of Columbia. For more information about all of the restaurants on this list, please visithttp://www.opentable.com/bestservice. Yasmin and Darrell visit Second Empire as a possible option for a reception site. Second Empire is happy to announce that we are now accepting reservations online via OpenTable. You can also click here to make a reservation, or as always you can call us at 919-829-3663. Our Chef’s Table Experience was recently written up in the Boston Globe. They enjoyed the experience, you should call now to set up your own visit to the Chef’s table and create a unique experience! Read the Boston Globe’s article reviewing our Chef’s Table.